Our signature fresh-baked cookies in your choice of one of our signature flavors and hand-dipped chocolate covered pretzels are perfect for celebrating the big game! 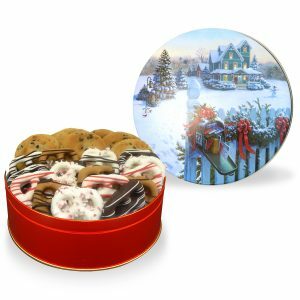 Choose a fun stock tin design or personalize it with your own picture or message. Regular: 10 fresh-baked gourmet cookies in your choice of flavor, 6 milk chocolate mid-size pretzels and 6 white chocolate mid-size pretzels. 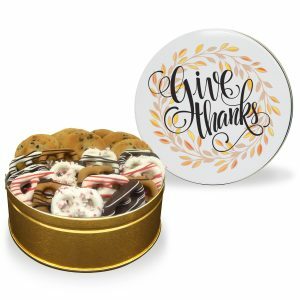 Large: 20 fresh-baked gourmet cookies in your choice of flavor, 12 milk chocolate mid-size pretzels and 12 white chocolate mid-size pretzels. 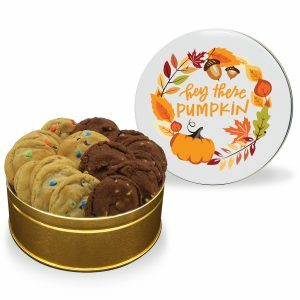 Our cookies are made fresh to order, without any preservatives, and have a shelf life of two weeks.